These are your account's appId and appSecret. Right after enabling API you should have both API keys generated. They are visible only for admin account, operators cannot see them. 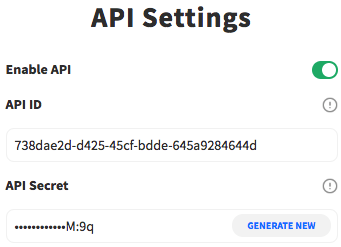 Please make sure to copy at least appSecret key, as next time you visit account settings it will be partially hidden as on the image above (only last 4 characters will be visible). First option is to generate new appSecret key using GENERATE NEW button on the right. This will result in overwriting current appSecret key and thus invalidating it. Second option is to disable API access and then re-enable it again. This will result in creating new appId and appSecret keys and invalidating previous ones. Make sure to replace "YXBwSWQ6YXBwU2VjcmV0" with your API key. Combine your appId and appSecret with a colon like this: appId:appSecret. Encode result using base64: appId:appSecret -> YXBwSWQ6YXBwU2VjcmV0. Please note that base64 is a reversible encoding. Please use HTTPS along with Basic Authentication. This endpoint creates a new case. notify string Notify operators (which are active) about created case. This endpoint retrieves all cases. Cases are sorted by date (newest first). This endpoint exposes filter API with available query params listed below. All params except filter[state] are concatenated in an OR query. If you have trouble with sending request, try encoding url, so that for example: GET https://api.vicodo.com/api/cases?filter[name]=Bates becomes GET https://api.vicodo.com/api/cases?filter%5Bname%5D=Bates. This endpoint retrieves a specific case. This endpoint updates a specific case. If successful, returns an updated case object. Please note that you don't need to necessarily pass whole case object. You can pass only fields that you want to update. This endpoint removes a specific case. If successful, returns a case that was removed. This endpoint retrieves a shortened invitation link for client.